For the second year, Outsourced Events was appointed to help and support Coversure with the end to end event management of their annual Conference. Bigger and better than before, the 2017 expo had more sponsors and attendees. 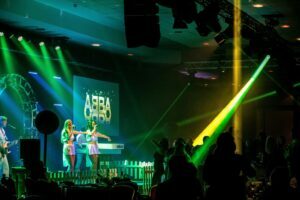 Taking place over 2.5 days, at The MK Dons Doubletree by Hilton in Milton Keynes the conference consisted of networking, meetings and seminars with 380 attendees, and entertainment on both nights, culminating in a gala dinner and awards ceremony hosted by stand-up comedian Ed Byrne. Group CEO Bob Darling and Managing Director Sarah Darling – outlined their vision for Coversure’s future and franchise holders took the chance to have one-to-ones with representatives from leading insurance companies including Aviva, LV, Covea and Close Brothers. Outsourced Events, were once again tasked with providing full end to end event management including event communications, logistics, accommodation management, sponsor liaison and onsite support. 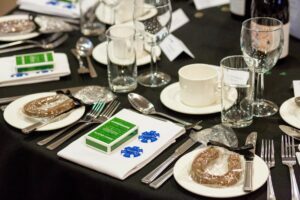 With a unique theme for each of their annual conferences, the 2017 theme was ‘At the Races’. Charged with providing some fun and interesting entertainment in keeping with the theme OE booked Roll a Ball Donkey Derby and an award-winning Abba tribute band, both of which created much buzz and provided the Coversure team with a great opportunity to let their hair down and celebrate a fantastic year.